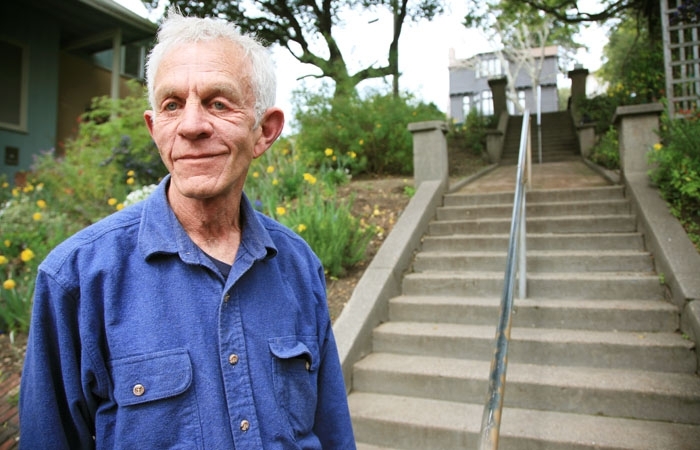 Bruce McMurray, a resident of North Berkeley, has worked to improve the condition of the Le Roy Steps with help from other community members. Yellow daffodils and wild lilac trees have now been added to line the steps. Looking out over the city of Berkeley and across the San Francisco Bay, Bruce McMurray stands on the recently swept Le Roy Steps, lined with blooming yellow daffodils and wild lilac trees - a sight that did not exist four years ago, before McMurray and his neighbors undertook a project to beautify the steps. In 2004, McMurray, 69, began to clean up the "gluck" and weed-covered steps, located between Virginia Street and Hilgard Avenue in North Berkeley, deciding to remove graffiti that had defaced the bottom steps. Four years later, he and neighbors Vicki Wade and Eleanor Lee cleared the weeds around the steps and planted deer-intolerant flowers. Last year, they planted about 400 daffodil bulbs, and this year they added 200 more. "The Le Roy Steps have taken on a life of their own, and they need to be nurtured and cherished," McMurray said, adding that over time neighbors have contributed around $3,000 to fund the beautification project. While McMurray, chair of Friends of Le Roy Steps - a neighborhood group dedicated to restoring the steps - attributes the continued project's success to the entire neighborhood, Wade, who visited the steps as a young child and later moved into her grandmother's old home next to the steps, said McMurray has been the driving force in improving the area. "Bruce really started helping and inspiring me," Wade said. "It's been a joint effort, but he's really put in a lot of the labor and the necessary dealing with the city. He's done a lot, and it's changed a lot." McMurray, who has lived in the neighborhood for about 30 years, grew up in Pasadena and later taught history at high schools on the east coast. In the 1960s, he continued his studies at the Harvard Graduate School of Education to avoid being drafted for the Vietnam War. "I got the draft board to get me a deferment on grad school, but I still had my bag packed because I was either going to turn 26 and be free, or get my draft ticket and head to Quebec," he said. After working in a bookstore and as union organizer in Massachusetts, McMurray moved to the Bay Area and started selling roller skates at Golden Gate Park in San Francisco. He then produced audio-visual projects - including public service announcements, slide shows and sound programs - winning a bronze Hugo Award at the Chicago International Film Festival in 1975, though he added that an interest in landscaping sprouted a new passion in daffodils and maintaining the Le Roy steps. Last year, the Friends of Le Roy Steps was awarded a $7,160 grant from the Chancellor's Community Partnership Fund to install lights styled after 1920s gas light fixtures as a measure to increase the pedestrian safety in the neighborhood, especially for spectators returning from concerts at Hearst Greek Theatre or football games at Memorial Stadium. The group also received a $1,500 grant from PG&E and a $500 from Councilmember Susan Wengraf's discretionary budget fund. "Every once in a while, there are people in the community who are willing to give, and I think Bruce is the supreme example of that," said Wengraf, whose district includes the steps. "He doesn't want any attention, he doesn't want any accolades, he just wants to be able to make it a better place." While walking up the steps with his wife Martha, North Berkeley resident Bill Moses remembered the rose bushes that bordered the steps in the 1980s before they fell into disrepair. "It looks different, and it looks great," Bill Moses said. "For me, they were always a pleasant place, and always a pleasant walk home." On a regular day, families, students and residents trot up the steps to catch a glimpse of the San Francisco skyline and the Golden Gate Bridge. While McMurray sits on the steps planting a new row of daffodils, some passersby compliment him and others comment on the lush surroundings. McMurray remembers a group of people who once stood at the bottom of the steps applauding him, and in response, he blushed and jokingly blew kisses.